Is there a place to register your violin? over 20 years ago I bought a violin from a private dealer in Montreal (Quebec) and he had some sort of books that were a registry of violins. In it he showed me the listing (with photos) for the antique french violin I was buying off of him, and it listed some of the previous owners. I have no idea what that book was called (encyclopedia size) but I remember this encounter. Since then I have not been able to find any such registry online or even a mention of such a thing - does anyone in these forums know of such a violin registry??? I recall having seen some issues, books, magazines etc, that present the work of one or more luthiers, mentioning many assets and features of each instrument depicted. Yet I do not recall something specific. Any help for info would indeed be appreciated. 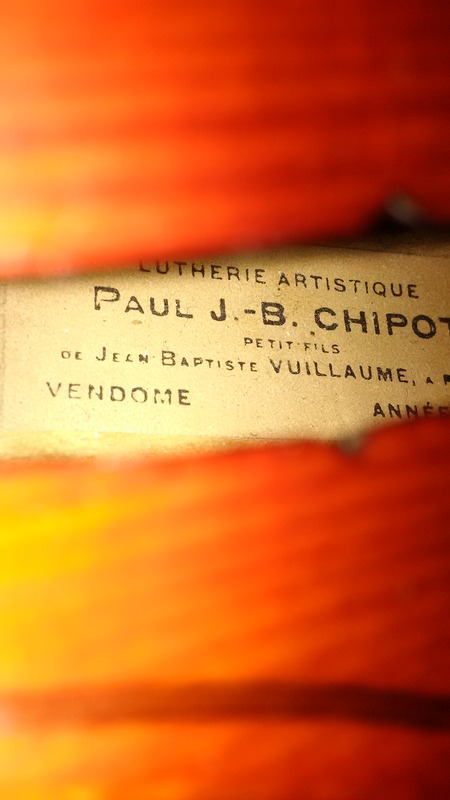 My violin is French and was made by a Paul J. -B. Chipot, 1927. I've attached a picture of the label inside. I have not played one myself but there seems to be no shortage of them ...if ya do a bit of web surfing there should be pictures from sales and auctions ..
CHIPOT, Paul Jean Baptiste Born 1887 Mirecourt, died 1892 Vendôme France. Son of Chipot-Vuillaume, below. Apprenticed in Mirecourt. Worked for Deblaye amongst others before settling in Vendôme in 1923. Awarded Grand Prix as the best artisan in France 1928. Very well crafted copies of Italian and Tyrolean makers with appropriate labels. Instrument garanti / Executé à la main / par le / Maître luthier J-B Chipot Lutherie artistique / Paul J.-B. Chipot / petit fils / de Jean Baptiste Vuillaume, à Paris / Vendôme Année 19.. Lutherie d'Art / Jean-Baptiste Chipot / Chevalier de la Légion d'Honneur / Fils de Chipot-Vuillaume / Petit-fils de Jean-Baptiste Vuillaume. Based upon this information, you may be the proud owner of one of the few violins made by a vampire. At first I suspected a zombie, but they are generally not good luthiers, whereas vampires can work all night and are very dexterous, plus they can hypnotize the weak willed into working in their shops for free. You'll notice that the author says that he died in 1892, and then went on to settle in Vendome in 1923 -- no other explanation -- vampire. It looks like they sell for the mid-hundreds to the low thousands, for example there's one for sale locally for $600, but I've seen auction prices indicating that some have sold for over 3k pounds in Europe. The wood has certainly had time to age, and assuming that they are well made should sound nice I would think. Tucson1 & Uzi thanks for the info, it is indeed helpful! This brings me to an idea. Since there is no online violin registry (as far as I know) then I am thinking of starting one myself (am an IT guy). My question is what sort of information would you want recorded to prove the existence of your violin (in case of theft)? I imagine people won't want a street address on there since it's an invitation to thieves but maybe a listing of the name, the country, photos and description? That way if someone had an insurance claim from a violin theft they could log into the site and pull up all the information on their violin? Thoughts on this? I'm thinking that one could place a special identifier in a spot that can't be seen by a thief without a mirror. Better yet would be a chip so the violin can be traced such as a snagg microchip. @chipot Thats a great idea. I think the hardest part would be identifying personal violins. They would almost have to be personalized. I know one of my violins is very unique, but those that are more "stock" won't have enough defining characteristics to be unique enough to tell apart i don't think. I know the one i bought doesn't have a serial number inside so unless i put an identifying mark inside (ask a luthier to help??) or do something like FM said with a gps it would be really hard. But a wonderful idea for those who are willing to do it!! but then again if you make it so people could post and update detailed pictures to go with it it might be more viable database??? Great idea anyhow! !